Welcome to North Coast Creations February Release! This month, North Coast Creations is releasing Spring and Easter stamp sets! Continue reading below to find out how you can win one of two North Coast Creations $10 Gift Certificates good towards the purchase of NCC Stamps. I'm sharing two projects today, using two of the sets from the NCC February Release, along with an older NCC stamp set, and Custom Dies, stamps and paper collection from Our Daily Bread Designs. I created a Triangle Box from Pumpkin card stock, and added texture to the card stock using an Impression Plate. The cute bunny is from the Hippity Hoppity stamp set, stamped on Our Daily Bread Designs Shabby Rose Paper Collection (being released March 1, 2015). 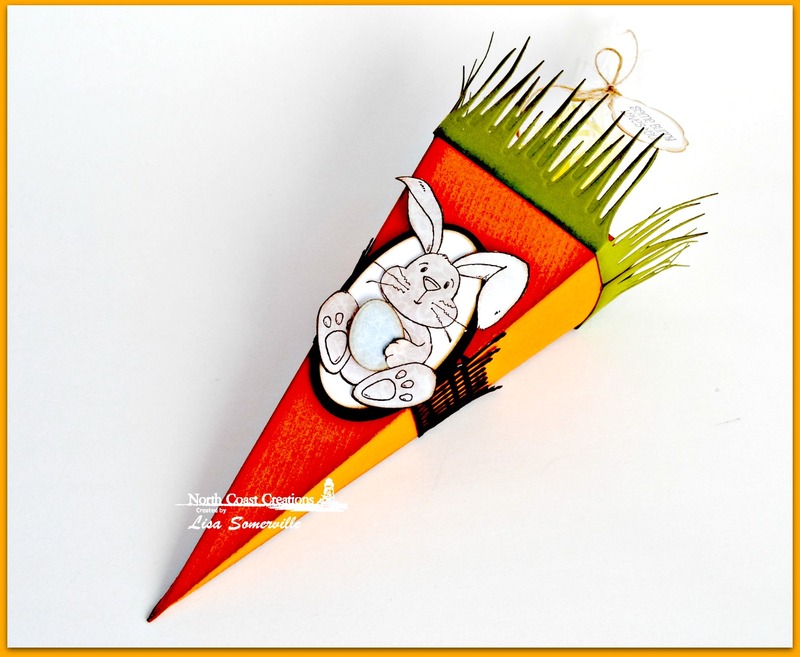 The bunny is holding a small egg that was die cut from the same paper collection using the ODBD Custom Eggs Dies (being released March 1, 2015). I added the Gilded Gate Die to the side of the box and the ODBD Grass Border Die (being released March 1, 2015) to the top of the box using Scor-Tape. My next card uses the new Pansies stamp set along with a sentiment from the Floral Sentiments stamp set, and products from NCC Sister Company, Our Daily Bread Designs. 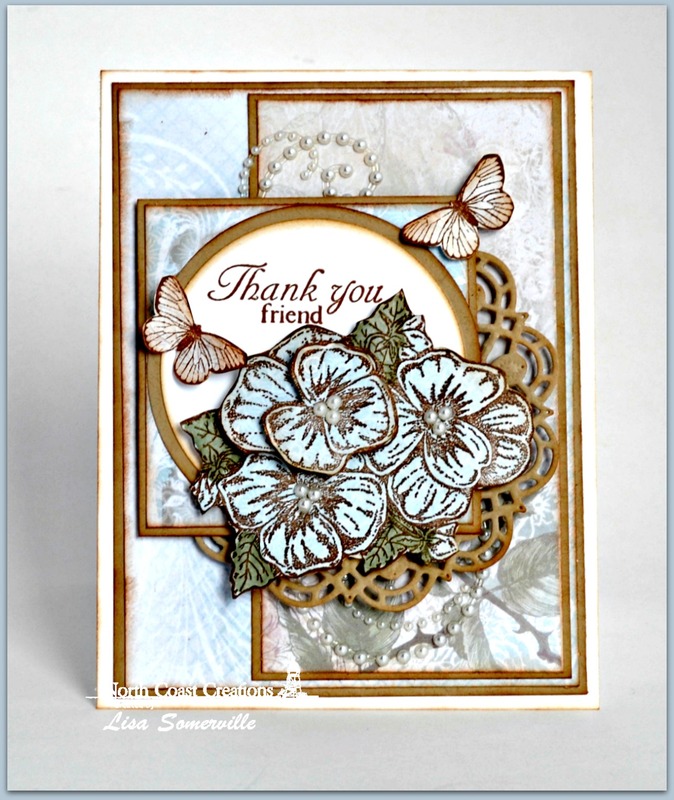 The Pansies and Butterflies, are stamped on scraps of the Shabby Rose paper collection. To add dimension to the Pansies, I used the Paper Tole Technique. My layout uses additional ODBD Custom Dies, you can find those linked in below. To embellish I added Zva Creative Crystal Gems. Two randomly selected winners will each receive a $10 gift certificate to North Coast Creations, good towards the purchase of NCC stamps, just for commenting on the Design Team cards! You have until February 17, 2015 at 10:00 PM EST to leave a comments on the participating designers blogs for a chance to win! Winners will be posted February 18th, on the North Coast Creations Blog, so be sure to check back there to see if you are one of the winners! That carrot box is adorable...how clever!! Your pansy card is beautiful...love all the layers!! Lisa, you ROCK! LOVE the carrot box....too adorable!! Your pansy card is super gorgeous....love the colors you chose...yummy!!! Fabulous job on both!! HUGS!! I love your carrot box- so cute!!! The pansy card is gorgeous- I do love pansies so this card is a favorite with me. Your carrot box is so cute, Lisa! Great idea! And the soft blues of your pansy card are lovely.The pearls and doily behind them are beautiful. That bunny is so sweet- and love the carrot. Your floral pansy card is just beautiful! Beautiful card Lisa! Just adorable!!! Adorable carrot box and I like all the layers on the floral card. OMGOSH!!! What an adorable carrot treat box!!! And your pansies are gorgeous! your pansy card is just beautiful! love the added butterflies! That carrot box is too cute! And I love how you nestled the egg under his little paw! The card is perfect! Love the muted colors you used on this one. OMG, Lisa! The carrot box---SOOOOO CUTE!!! How did you make the carrot box part? Is that a die? I just love it!! And the pansy Thank You card--GORGEOUS, Lisa! The colors and layers are just beautiful! I love those swirls of pearls that peek out just enough and the little pearl centers of each flower! Soooo pretty!! Just lovely cards for the NCC February Release! You Go Girl!! Cute carrot box!! LOVE the Pansies card. SO pretty!!! Cute carrot box.... love your coloring!! !